The femur is the largest and strongest bone in the body. 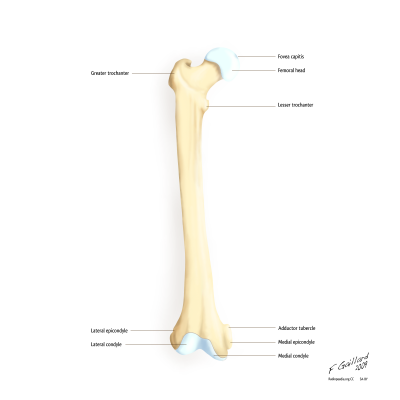 Osteologic features of this long bone include the femoral head and neck, greater and lesser trochanters at the proximal end, the femoral shaft, and the femoral condyles distally. At the proximal end of the femur, the bulbous femoral head is joined to the shaft of the femur by the femoral neck. At the base of the neck are the medially oriented lesser trochanter and laterally placed greater trochanter. A rough line called the intertrochanteric line connects the greater and lesser trochanter on the anterior aspect of the femur, while the smoother intertrochanteric crest connects the trochanters posteriorly. The angle between the femoral neck and the medial side of the femoral shaft viewed from the frontal plane is known as the angle of inclination. This angle is greater at birth but decreases during childhood and adolescent development due to loading stresses across the femoral neck in weight-bearing and walking. Ideally, a normal angle of inclination of 125 degrees increases mobility of the femur at the hip joint by placing the femoral head and neck in a biomechanically favourable position for walking. 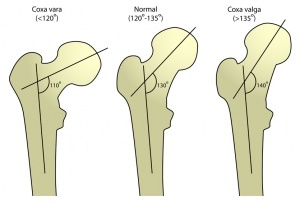 Abnormal angles, known as coxa vara for an angle much less than 125 degrees and coxa valga for an angle much greater than 125 degrees, alter hip biomechanics, leading to malalignment and complications. The shaft of the femur courses on an oblique lateral to medial angle, functioning to bring the alignment of the knees and feet closer to midline. The ridge-like linea aspera runs along the posterior aspect of the shaft. Prominent lateral and medial condyles are found at the distal end of the femur. Projecting from each condyle is an epicondyle that act as attachment sites for the collateral ligaments. The lateral and medial condyles are separated by the intercondylar notch. The femoral head of the proximal femur articulates with the acetabulum of the pelvis, forming a "ball-and-socket" joint, in which the femoral head acts at the ball and the acetabulum as the socket. This formation allows for movement at the hip in three planes: flexion and extension in the sagittal plane, abduction and adduction in the frontal plane, and internal and external rotation in the horizontal plane. Distally, the convex femoral condyles of the femur articulate with the condyles of the tibia, forming the tibiofemoral joint. Movement at the tibiofemoral joint occurs in two planes: knee flexion and extension in the sagittal plane, and internal and external rotation in the horizontal plane. The patellofemoral joint is formed by the articulation of the patella with the intercondylar/trochlear groove of the femur. During flexion and extension of the knee, the articular surfaces of the patella and femur perform a sliding movement. As the largest and strongest bone in the body, the femur serves an important weight-bearing function and is an essential component of the lower kinetic chain. The robust shape of the femur provides many sturdy attachment points for the powerful muscles of the hip and knee that contribute to walking and other propulsive movements. Femoral fractures can occur at the femoral head, shaft, or condyles, with a fracture of the femoral neck being the most commonly fractured location. Osteoporosis is a significant risk factor for fractures of the femoral neck. Patellofemoral pain syndrome (PFPS) is a common sports-related injury that presents as pain around or behind the patella, typically with an insidious onset. The cause of the condition is unclear, but neurologic, genetic, neuromuscular and/or biomechanical factors may contribute to its development. A femoral stress fracture is a condition characterized by an incomplete crack in the femur (thigh bone). Several muscles of the hip, knee and thigh attach to the femur. When these muscles contract, a pulling force is exerted on the bone. In addition, weight bearing activity places compressive forces on the femur. When these forces are excessive or too repetitive, and beyond what the bone can withstand, bony damage can gradually occur. This initially results in a bony stress reaction, however, with continued damage may progress to a femoral stress fracture. Cause of a femoral stress fracture: A stress fracture of the femur typically occurs over time with excessive weight bearing activity such as running, sprinting, jumping or dancing. They often occur following a recent increase in activity or change in training conditions (such as surface, footwear or technique changes etc) and are particularly common in long distance runners. Signs and symptoms of a femoral stress fracture: Patients with this condition typically experience a poorly localized pain in the front of the thigh that increases with impact activity (such as running, jumping, sprinting and hopping) and decreases with rest. Pain may also cause the patient to cease activity. Occasionally, pain may radiate to the knee or back of the thigh. In severe cases, walking or standing may be enough to aggravate symptoms. Other symptoms may include night ache, pain when sitting with the thigh over the edge of a chair (especially if a downwards force is applied to the end of the thigh) or pain on firmly touching the affected region of the bone. Diagnosis of a femoral stress fracture: A thorough subjective and objective examination from a physiotherapist may be sufficient to diagnose a femoral stress fracture. Further investigations such as an X-ray, MRI, CT scan or bone scan are usually required to confirm diagnosis and determine the severity of injury. ↑ 1.0 1.1 1.2 1.3 1.4 Moore KL, Agur AM, Dalley AF. Essential Clinical Anatomy. 4th ed. Baltimore, MD: Lippincott Williams and Wilkins, 2011. ↑ 2.0 2.1 2.2 2.3 2.4 2.5 2.6 Neumann DA, Kinesiology of the musculoskeletal system: Foundations for rehabilitation. 2nd ed. St. Louis, MO: Mosby Elsevier, 2010. p520-71.